July 5, 2016 8:00 A.M.
Never leave your pet unattended in the car - the temperature inside your vehicle will quickly become much hotter than the temperature outside. 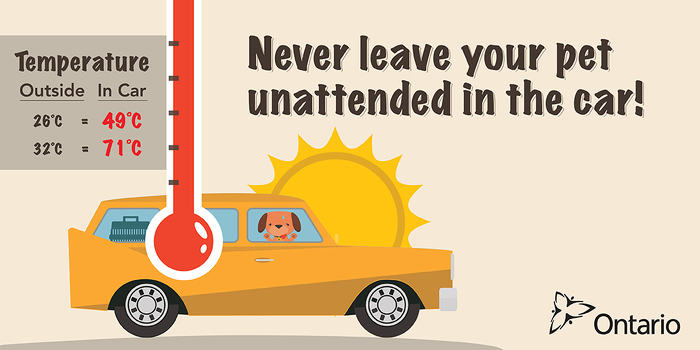 If you discover a pet left unattended in a hot vehicle, call 310-SPCA (7722) in Ontario, your local SPCA or Humane Society, or your local police department. Ensure your pet is properly secured at all times. Smaller animals are more secure in a crate attached by a seat belt. If your pet is restrained with a leash or harness, make sure there is enough slack for them to move around a bit and adjust their position. Always have fresh water available in the car. Bring favourite toys and a pillow to prevent your pet from becoming restless during the ride. Add a pet emergency kit to your travel checklist that includes medical records, medicines and first aid items such as nail clippers and liquid bandages. Help your pet prepare for its first road trip by taking short drives before your vacation. If your pet experiences motion sickness, consult your vet about possible medications. Six out of 10 pet owners in Ontario travel with their pets at least once a year and over half of all pet trips are with dogs. This document was published on July 05, 2016 and is provided for archival and research purposes.